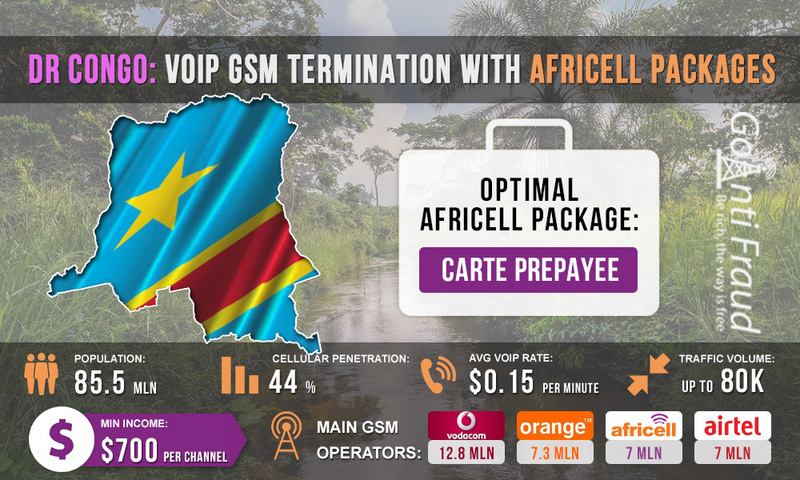 Africell is the third largest operator in the Democratic Republic of the Congo. The number of its clients reaches about 7 million people and a lot of international voice traffic passes through it. In addition, Africell has an inexpensive cellular connection. Landing calls using Africell SIM cards, you can earn at least $800 per channel, provided you select the right tariff plan for voice termination. $ 0.001 per minute from 06:00 am to 11:00 pm. Absolutely free unlimited calls from 11:00 pm to 06:00 am. We do not recommend using the free-calls offer at night. Antifraud systems analyze the subscriber activity, comparing it with the “humanity” parameters. Increased nighttime activity is suspicious for the operators. Night calls should be reduced to minimum. Terminating for 300 minutes a day, you will get an income of $800 and more from each channel of your equipment voip voice gateway with router. Please mind that in regions with a high average rate, antifraud systems operate more actively, tracking the traffic termination. This is due to the fact that the more expensive the rates for international calls are, the more profits the operators lose due to the actions of terminators. Therefore, protect your SIM cards from the operator’s analytical and calling programs in advance, using GoAntiFraud tools. Competent simulation of a real subscriber behavior in the GSM network will positively affect your profit.